The Idyllwild Author Series, featuring some of California’s most celebrated writers, is more than half over, yet it is quickly gaining momentum. It began mid-May at B’s Mountain of Books, with eight authors. Since then, they’ve added two more, plus another Idyllwild location. These authors are either friends or close acquaintances of originator Eduardo Santiago, author of “Tomorrow They Will Kiss,” and a part-time Idyllwild resident. 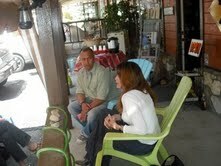 He invited these best-selling authors to come visit Idyllwild during select Sundays from mid-May to early July. He sets them up at a local inn, plans and then runs the interview/discussion sessions. The best-selling authors include: David Francis (Stray Dog Winter); Hope Edelman (Motherless Daughters); Leslie Schwartz (Angels Crest); Janet Fitch (White Oleander); Gary Phillips (Bangers); Mary Otis (Yes, Yes Cherries); Noel Alumit (Talking to the Moon); Rachael Resnick (Love Junkie); James Brown (This River) and Andrew Foster Altschul (Deus Ex Machina). Most of them live in the greater Los Angeles area, and they make the trip up to Idyllwild willingly. “Still I’m shocked that they make the drive,” said Santiago, after the session featuring Hope Edelman, a New York Times bestselling author of “Motherless Daughters,” and four other bestsellers. During the discussion/interview, Hope said that she was happy to see so many people in attendance. 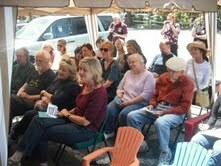 There was about 30 locals there, including authors, writers, editors and business owners. Oftentimes, at Barnes & Noble, she said, only 10 people show up. (from L) Eduardo Santiago interviews Hope Edelman, author of "Motherless Daughters"
Eduardo, who has no vested interest in B’s Mountain of Books, said that he has always held a romantic notion of bookstores and wants to keep them alive. Yet, most would agree that authors and bookstores go hand-in-hand, and need to support the other. Hubert Halkin, owner of Cafe Aroma, who has attended many of the sessions, said that Eduardo has taken a professional approach to the series. Eduardo conducts the interview/discussion that generally lasts an hour. “If someone asks a question, and the discussion goes off in another direction, Eduardo goes with it,” Hubert added. 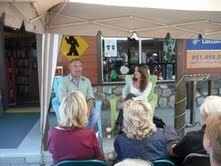 The Idyllwild Author Series is good for the originator too. “I love it because it gives me an opportunity to renew friendships and blatantly ask questions that I would be more reluctant to ask in a social setting,” Eduardo admitted. He said the Janet Fitch event, held on June 5, was “awesome.” There were about 50 people there, with two tents set up and every chair filled. During the discussions, Eduardo asks pointed questions about the featured book. Then the author reads a few excerpts, and then he opens it up to questions from the audience. Hope Edelman, who brought her two young daughters, along with homemade cookies, was very comfortable talking before an audience, not only about “Motherless Daughters,” but her other books as well. 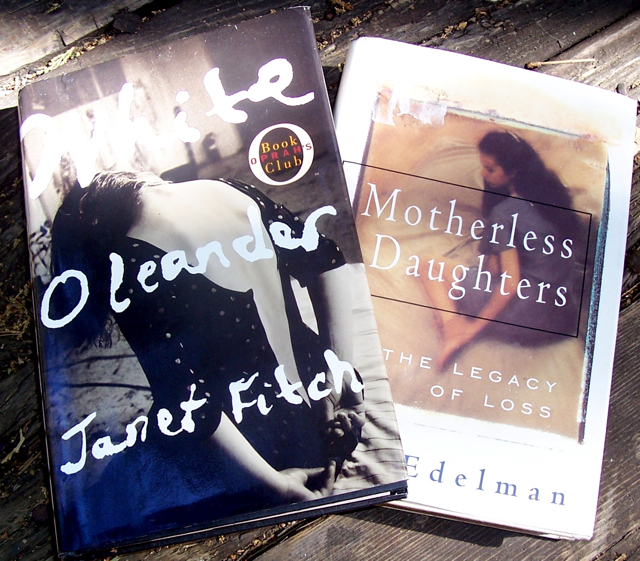 “Motherless Daughters” is a compilation of experiences cited by women who have lost their mothers at an early age. Hope talked about how she started out writing the book as an assignment at the University of Iowa Writing Program. She had no idea that “Motherless Daughters” would touch so many people. Up until that time, there had only been books published about daughters who lost their mothers later in life. Hope had lost her mother when she was only 17. Then she talked about her new book, “The Possibility of Everything,” and writing about relatives. “The Possibility of Everything” is about her young daughter’s experience with an “imaginary friend.” When the “friend” began to alter her daughter’s personality, she took the advice of her housekeeper and visited a Mayan healer in Belitze. The book covers the entire emotional experience. “Why did you write a book about me?” Hope said that her daughter asked. Her 13-year-old didn’t like the book idea at all. During that experience, she was able to accept things beyond her imagination, she said. Still, Hope suggests that writers continue to write about their relatives, if the story is compelling. “In my experience, they never object to things you’ll think they’ll object to,” Hope said. Many in the audience were big fans of Hope’s, having read many of her books. “This series is a great way to meet your favorite authors in person, and ask them any question you want to about their books,” one woman said. Eduardo said that many attendees ask private questions as the authors are signing their books afterwards. The next session of the Idyllwild Author Series will be held this Sunday, June 19, at 2 p.m. featuring Mary Otis, an award-winning author, whose short story collection, “Yes, Yes Cherries,” was published in 2007. The event is free and open to the public. It will be held in the tent outside B’s Mountain of Books at 54385 North Circle Drive in Idyllwild. B’s carries all of the Idyllwild Author Series books. For more information, contact Eduardo Santiago at www.eduardosantiago.com, or call the bookstore at (951) 659-5018. Copyright 2011 Idyllwild Me. All rights reserved. All Hope Edelman photos courtesy of Mark Davis.